Well, there goes another crazy week (Raiders beat Chargers, Cardinals beat Saints, Lions notch first win, 49ers fall to 0-5) in the NFL! If you had any games on the line last night, it was well worth staying up for. Brett Favre showed he still has fantasy relevance, Mark Sanchez showed that he is a very good QB against a good defense. Also, Santonio Holmes and Randy Moss played a lot more than expected and both made big contributions to their respective teams. Moss with a big TD to help bring back the Vikes and Holmes with a nice isolation one on one grab for a first down at the end to help ice the game. One other thing to take away from Monday nights game, LT is a stud. Like Thomas Jones last year, the guy can just read his blocks. On to the rest of what happened for the junkie and his predictions. Quite possibly my best pick ever, going with the Detroit Lions DEF in almost all of my leagues. It paid off big time as they were the number one DEF of the week! I was also correct with Fred Jackson (Barely, tied for 24th), and Brent Celek (6th). I missed on three with Josh Freeman (12th), Derick Mason (40th) and the New Orleans DEF. A miss is a miss but come’on Brees! That New Orleans Def played really well. It was the offense that gave up too many turnovers for points that cost them a good rank this week. Don’t go thinking that the Cardinals are a good team. The Saints offense just played offensive. 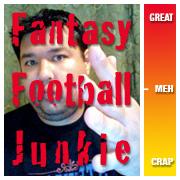 As for my totals, I went 4-2 in my leagues and 3-3 in the players to start. Not a bad week for the Junkie! Some guys to keep an eye on for waivers are Mike Hart, IND RB and Nate Burleson, DET WR. I will have a pick up column coming later… stay tuned.